Monaco - where everything that glitters is, if not gold, then certainly diamonds. This tiny principality held snug against the alps is bred on excesses. The rich and the famous flock here to shelter their wealth from taxes and show it off to one another. A magical place where fortunes have been won and lost, a tiny country that defies belief. The second smallest state in the world after Vatican City and a heritage that goes back to 1297. 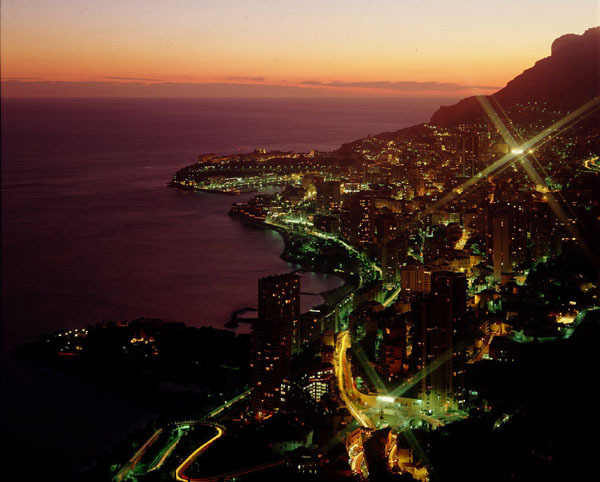 Monaco has been hosting the Monte Carlo Grand Prix since 1929 and F1 Demons has brought out this page to satisfy your thirst for information on this tiny, densely populated principality becomes the most important venue for F1 racing. # Monaco-Ville on the Rock, the old fortified town, with the Prince's Palace, the ramparts, the gardens, the Cathedral and the Oceanographic Museum. # Monte Carlo, created in 1866, in the reign of Prince Charles III who gave it its name, with its internationally famous Casino, its great hotels and leisure facilities, some created recently : Larvotto beach, the Monte Carlo Sporting Club, the Boulingrins Gardens. # Fontvieille, a great technical achievement with the filling-in with rock of 40 meters of water to produce a platform of 22 hectares supporting an urban, tourist and sports complex adjoining a yachting harbor and a pollution-free industrial zone. 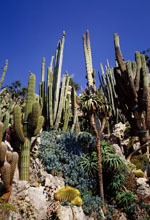 # Moneghetti, the Révoires and the Exotic Gardens (on the western border with Cap d`Ail). Traditionally Monaco has been famous for its casinos but more recently it has become an industrial hub. It has no income or inheritance tax and therefore is full of people who flock to this tiny principality to hid their money and show it off to one another. This is certainly the ultimate playgroung of the rich. The rich and the super rich flock to Monaco to set up residence there. However those with residence permits are expected to occupy them for at least six months a year. But nobody does. 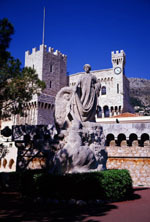 For several centuries, the citadel of Monaco was coveted by the enemies of the Grimaldi, resulting in many conflicts with the Genoese, the French and the Spanish. For this reason, for nearly 400 years, the Rock maintained its character as a fortress and was principally concerned to develop its defences. Towards the middle of the XVIIth century, Prince Honoré II (1597-1662) undertook the earliest steps to transform it into a palace. The military structures were retained, but the interior was totally altered so as to house the superb collections of paintings by master artists, tapestries and precious furniture. Towards 1690, Prince Louis I (1642-1700) had constructed the great gate which still exists today. This gate opens on to the Court of Honour, admirable in its proportions, with its double stairway in Carrara marble leading to the Gallery of Hercules and which, despite the modifications carried out, may be considered as the old central part of the fortress built at the beginning of the XIIIth century. The Treaty of Paris of 1815 restored full and complete sovereignty to Monaco and Honoré IV (1758-1819) and Honoré V (1778-1841) undertook the restoration of the Palace robbed of its collections and damaged to a considerable extent during the French Revolution. Florestan I (1785-1856) pursued the work of restoration with success. Charles III (1818-1889) had the St Mary's Tower and the buildings surrounding it reconstructed in the style of Florentine palaces. He gave the Chapel of St Jean the Baptist, built in 1656, a new altar. Albert I (1848-1922) had the Clock Tower constructed using white stone from la Turbie. Louis II (1870-1949) directed his activities to large-scale maintenance work. Since his accession in 1949, H.S.H. 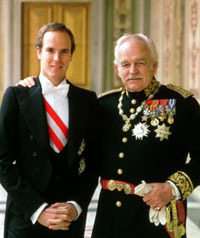 Prince Rainier III has adopted as his goal the embellishment and modernization of the Palace. The old frescoes were restored. The Court of Honour was paved with three million white and coloured stones forming immense geometrical figures. 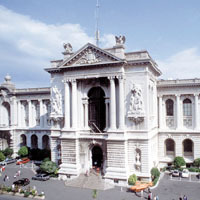 The southern wing, destroyed during the Revolution, was rebuilt and now houses the private apartments of the Sovereign's family as well as the Museum of Souvenirs of Napoleon and the Archives of the Prince's Palace. The great apartments are open to the public from June to October, while the Napoleonic Museum and the Archive collection may be visited throughout the year. Every day, at midday, the ceremony of the Changing of the Guard is performed by the section of the carabiniers responsible for guarding the Prince's Palace. It takes place on the Palace Square, using a ceremonial involving a great deal of marching and counter-marching which evokes the admiration of the large number of tourists. 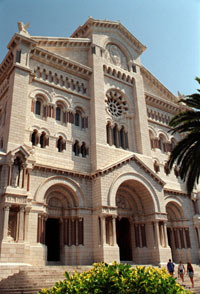 The Oceanographic Museum is one of main attractions for tourists in the Principality (it houses the collections made during the course of numerous cruises of this "Scientist Prince" whose work provides the basis of modern oceanography. Built by Prince Rainier's great Grandfather Prince Albert I, one of the vocations of the Museum is to welcome scientists from all over the world who have 2,000 square metres of laboratories at their disposal. On the ground floor, the collections on show represent the complete range of marine and submarine fauna with the often gigantic skeletons of oceanic mammals. Also to be seen are the diving saucers and other equipment used during his researches by Commandant Jacques-Yves Cousteau, Director of the Museum until 1988. On the first floor there are models of the various ships used by Prince Albert I for his explorations and the laboratory, reconstructed full-scale, of "Hirondelle II", his favourite yacht. There is also a hall devoted to oceanographic research, considered to be one of the most complete in the world. Finally, the aquarium, one of the most spectacular in Europe, with nearly 4,000 fish (around 350 different species) occupying 90 basins. The Museum also houses a meteorological station and a seismological observatory. Finally, the public terrace provides a magnificent panoramic view of the Italian Riviera and the Massif of the Esterel.